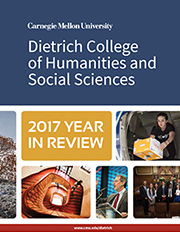 Dietrich College has roughly 30 different minors, ranging from African and African American Studies and linguistics to global systems and management and gender studies. Additionally, several minors are adapted versions of some of the college's majors. Undergraduate students from across CMU are welcome to pursue any minor offered by the Dietrich College. Learn about the philosophical underpinnings and cultural and historical contexts of the interplay among science, technology and society. Gain an understanding of societies, their histories and how they change over time.